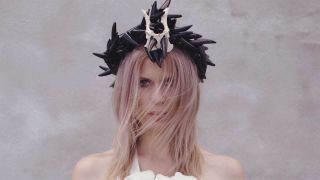 Vocalist and multi-instrumentalist Amalie Bruun, aka Myrkur, has launched a video for her reinterpretation of ancient Danish folk song Bonden og Kragen. The track will launch tomorrow (December 7) as a limited edition 7-inch single which will also feature Juniper, which Myrkur shared in November. Speaking about the traditional Danish song, Bruun says (via The PRP): “The song dates back to around 1600. It exists in many different versions, including Swedish and Norwegian. “The tale features a peasant/farmer who ventures into the woods and shoots a crow. A local bishop gets word of this and demands to know what the peasant will use the dead crow for. Both Bonden og Kragen and Juniper will also arrive tomorrow on digital platforms, with the release coinciding with Myrkur’s winter UK and European tour.